Variable message signs are the safest means for notifying motorists of changes in traffic patterns and road conditions. Wanco message signs are ultra-bright and highly legible, with a variety of functions for any application lane closures, highway construction, work zones, parking lots, and more. The Three-Line Message Sign is capable of displaying three rows of alphanumeric characters. When you need to get information to the public, the Three-Line's highly legible, ultra-bright LEDs display your message clearly. Unsurpassed quality, engineering and value, paired with a multitude of functions and options, make this sign perfect for a wide variety of applications. Height Of Tower 9 Mtr. 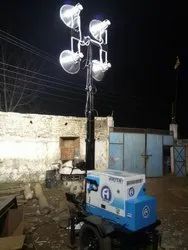 Arise offers you next generation Mobile Light Towers/Telescopic Light Towers. Fabricated at its state-of-the-art manufacturing facilities at Roorkee, Arise’s Mobile Light Towers lighten up your work areas to improve your workforce efficiency and overall productivity and also ensures safety during constructional activities during dark hours. Mobile Light Towers have been designed in a way which makes them durable as well as energy efficient. We make use of internationally acclaimed suppliers and thus emit intense white/yellow light. They incorporate aluminum reflectors which ensure reduced glare, better performance and reduced required wattage. Due to their wide application capabilities including complete 360° rotatable light board, Mobile Light Towers are perfect companions for mining areas, construction sites, civil engineering works, defence requirements and industrial operations. 4 x 400w metal halide Lamp. Extended height upto 9 meter from ground level. DG set complies with latest CPCB norms. Inbuilt Trolley for toeing the system from one place to another place. 1. Engine, power generator and chassis are all in world well-known brands that have stable and reliable performance. 2. With the application of scientific design, reflector of the lamp adopts the combination of multiple hooked surfaces to ensure the due attention to both short and long-range targets, long illumination distance and large illumination area. Moreover, the level of protection could be as high as IP65. 3. The lifting poker adopts manual, electric and hydraulic lifting, and the coverage radius of the light could reach the range of 150m to 200m. 4. The lamp post could rotate for 360° in horizontal direction, and the lamp holder could change the refraction angle in the range from 0° to 270°. 5. Advanced complete vehicle design, vehicle body with large frame and stable chassis (fixed with five-point support) work together to guarantee the reaching of Class VIII wind resistance performance. 6. With the application of deceleration braking type winch with high performance, the product could easily complete the ascending, descending and folding operation. The product has dual parking brake and tail light for transportation safety. 7. Mobile lighting equipment is applicable for outdoor lighting for emergency situations like earthquake, flood control, emergency and disaster releasing and etc. It is widely used in large public places like airport, wharf, gymnasium and aerodrome and outdoor mining sites with emergency backup lighting requirements like coal mine, gold mine, iron mine and etc. 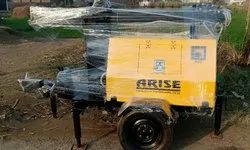 Arise offers you next generation Portable Mobile Light Towers/Telescopic Light Towers. Fabricated at its state-of-the-art manufacturing facilities at Roorkee, Arise’s Mobile Light Towers lighten up your work areas to improve your workforce efficiency and overall productivity and also ensures safety during constructional activities during dark hours. 4 x 100w metal halide Lamp. Extended height upto 4 meter from ground level. Looking for Mobile light Tower ?